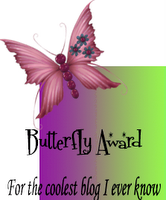 This award was given to me by Jenn at My Beautiful Creations. She thinks my blog is cool! Hers is pretty awesome, too. Thanks, my friend! 6. Give a reason why you consider their blogs cool. And We'll Alll Float On - because she writes from her heart and reminds me of myself sometimes. I'm an Organizing Junkie - because she is my role model! LuLu's Petals - She is both funny and poignant, often on the same post. The World Through Chrissy's Lens - She has the coolest photos! Up the Hill Backwards - She never fails to make me laugh! Queen Size Funny Bone - Cool because she's just cool! Funny, smart, and easy to relate to. Through Our Eyes - Very talented and what a cool blog! Mother, Daughter, Sister, Friend, Me - She's lively, optimistic, and I know she'd be fun to hang out with. My Life is Based on a True Story - She's sweet, honest, and I relate to her, and that makes her cool. Genuine Gem - She's honest, down-to-earth, talented, and thought-provoking. you DO have a cool blog! congrats! and thanks so much for passing it on to me!! You have a cool blog I love the variety that your blog brings. Congratulations - you deserve it!! Hope you're having a great week. Congrats on YOU receiving it as well. CONGRATS on the well-deserved award, and THANK YOU for passing it along to me! I'm speechless!